Creamy and cheesy tortellini comfort in one bite. 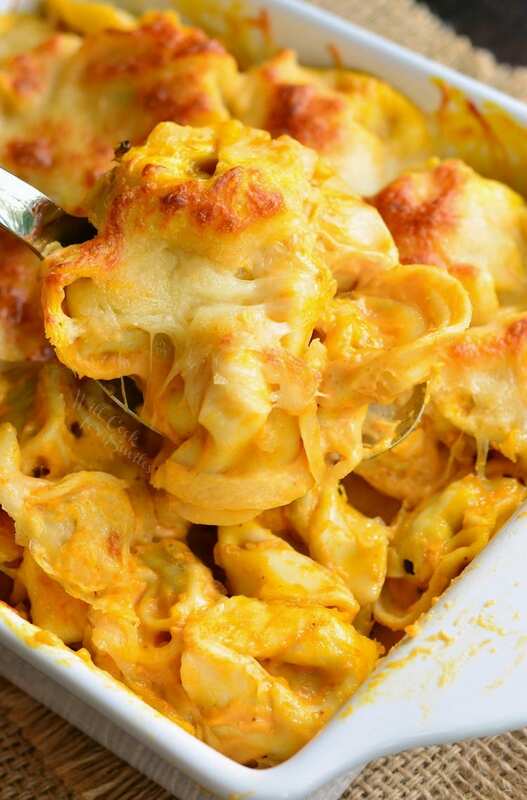 This delightful tortellini bake is made with a creamy pumpkin sauce and loaded with gooey cheese. 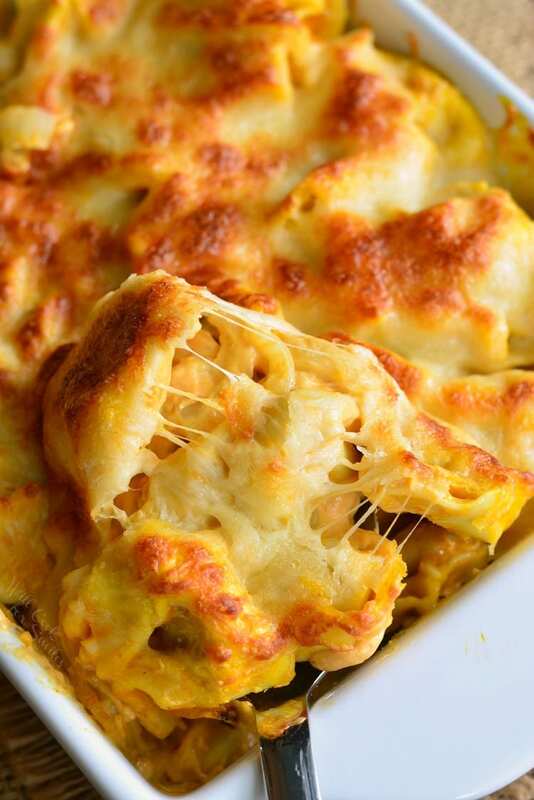 Feel free to add some protein to this pasta bake for more protein. 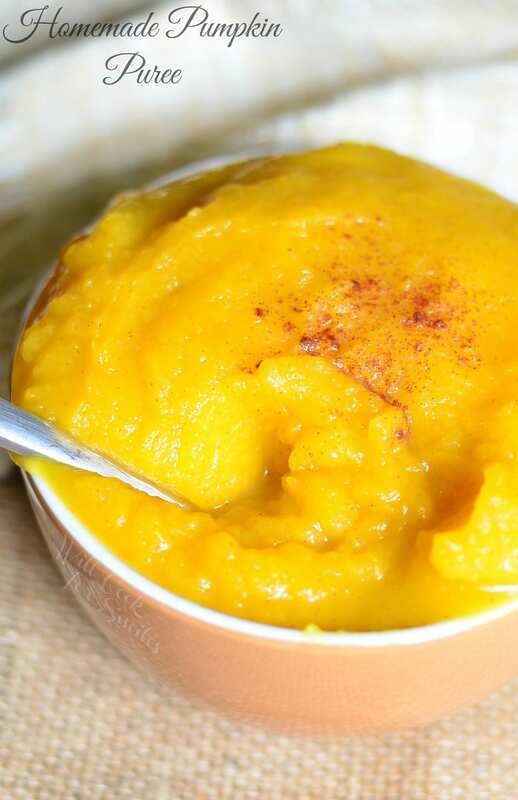 Raise of hands if you love pumpkin! Now, raise your hand if you like pumpkin in savory recipes. I really wish I could see everyone’s hands go up in the air and I hope there are A LOT of them! Unfortunately, my husband is not a full convert to savory pumpkin recipes yet, but I’m getting him there. Personally, I’ve been in love with everything pumpkin since I can remember myself. My grandmother grew pumpkins and every fall, I helped her harvest them. 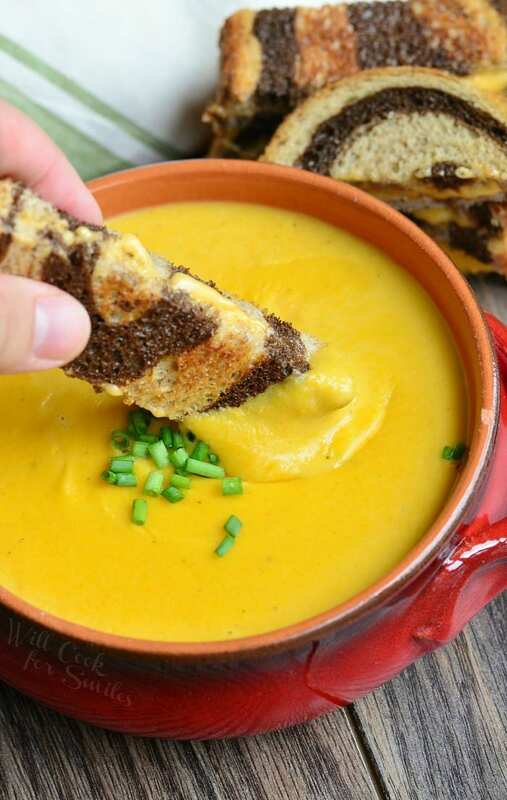 After that, we had pumpkin in just about every recipe you could think of, from savory to sweet. So I grew up with pumpkin in my soul. Every year, I start making pumpkin recipes in August. This year, I started very early August, when my little guy requested pumpkin pancakes as his birthday breakfast. Then, my husband begged for some Pumpkin Cheesecake Pie. It’s his absolute favorite and getting him to share it is not easy. He actually loves all sweet pumpkin treats but needs some convincing when it comes to savory. I guess he grew up with a thought that pumpkin is only meant to be in sweet recipes, so he has a hard time getting passed that. I, on the other hand, grew up with pumpkin in EVERYTHING sweet and savory. 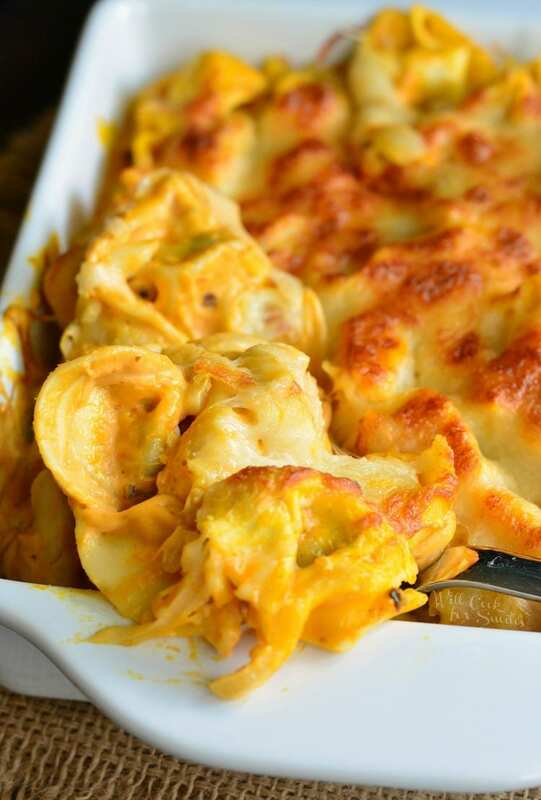 Like other squash, pumpkin is wonderful is hearty, savory recipes, just like this CHEEESY pumpkin tortellini dish. 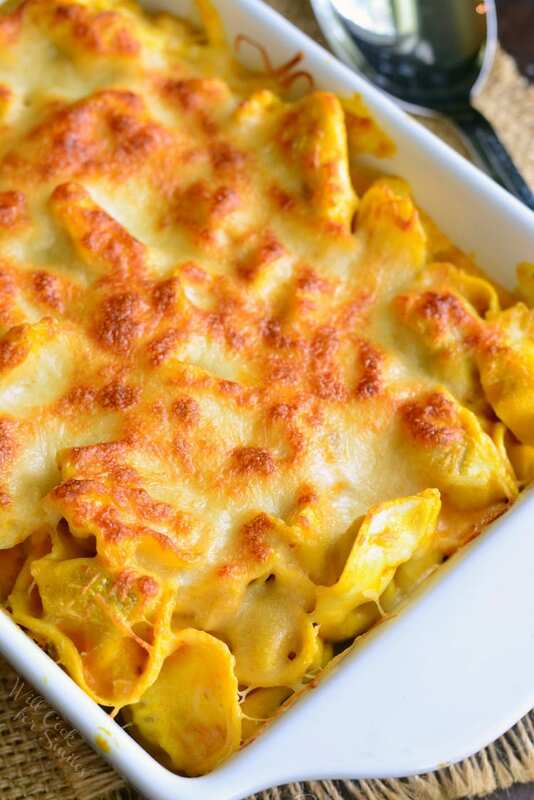 This comforting pasta tortellini dish is made with a creamy pumpkin sauce and lots of cheese. The three cheeses I used for this dish were Mozzarella, Parmesan, and Romano. 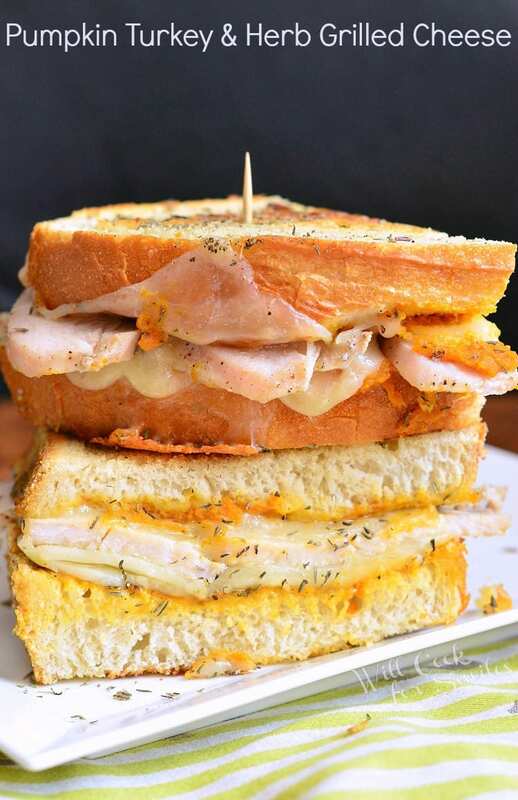 You can choose to add or substitute other cheeses, like Asiago or Provolone. You can use a cheese mix that is already pre-made or make your own by shredding equal parts of each. To spice up this tortellini bake, I used crushed red pepper flakes and some dried jalapenos. If you don’t have dried jalapeno peppers, you can add a little extra red pepper flakes or even some cayenne pepper. Just be careful, use a little bit at a time until desired spice level is reached. 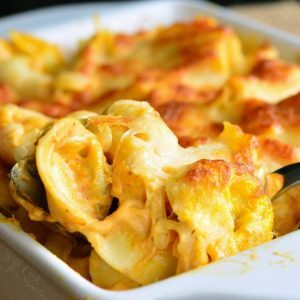 This delightful tortellini bake is made with a creamy pumpkin sauce and loaded with gooey cheese. Cook tortellini according to the package instructions until just done. Drain off water and set aside. Preheat the oven to 350 and lightly grease an 8x8 baking dish. In a sauce pot, heat up oil over medium heat. Slice onions thinly and add it to the sauce pot. Saute until softened. Smash and mince garlic and add it to the onions. Saute for a couple of minutes. Slowly pour in heavy whipping cream as you stir. Heat through and stir in pumpkin, dry jalapenos, crushed red pepper flakes, and salt. Stir well, until smooth. Cook (don't boil) for a few minutes and stir in cheese. Keep stirring until cheese is melted and smoothly incorporated. Take off heat. Gently fold sauce with tortellini until evenly coated. Transfer into the prepared baking dish and top off with some more cheese. Just finished off a bowl of this. The best pasta dish I’ve ever made!